UH Opera Workshop in Concert John Mount, director José Meléndez, piano Sister Grace Capelas, costumes Blair Boone-Migura, musical preparation Students of the Music Department's Opera Workshop course present staged scenes from operas and operettas. The program includes scenes from Tosca, Le nozze di Figaro, Little Women, The Consul. Tickets: $12 / $8 (UHM Music majors free) No additional cost to purchase your tickets in advance. Music students: This concert is eligible for Mus 199 concert attendance credit. University Chorus / UH Hawaiian Chorus University Chorus, Miguel Cadoy and Jonathan Michael Palompo, co-directors UH Hawaiian Chorus, Nola A. Nahulu, director tickets: $12 / $8 / UHM music majors free Purchase your tickets in advance at no additional cost Music students: This concert is eligible for Mus 199 attendance credit. UH Concert Choir and Chamber Singers @ St. Andrew's Cathedral Jace Saplan, director Admission is free, but donations to our Choral Legacy Endowment are gratefully accepted. Help support the choirs! Music students: This concert is eligible for Mus 199 concert attendance credit. UH Jazz Ensemble Dean Taba, director This semester's concert will employ Combo/Improvisation, and Jazz Vocalists featuring the music of John Coltrane, Benny Golson, Oliver Nelson, Herbie Hancock, Count Basie, and much more. Tickets: $12 / $8 (UHM music majors free) No additional cost to purchase your tickets in advance. Music students: This concert is eligible for Mus 199 concert attendance credit. Student Composers Symposium Hear new works by UHM music composition students. Free admission Music students: This concert is eligible for Mus 199 concert attendance credit. Heavy traffic and large crowds are expected for multiple athletic events scheduled on campus Saturday night. A limited number of stalls will be available in the music lot for our concert audience. The $6 parking fee will be required. •Purchase your ticket in advance. Use your receipt as evidence to the parking guards that you are attending the gamelan concert. •Arrive early. Once the structure fills up, possibly as early as 6:00 p.m., general access to Lower Campus Road will be restricted, making access to the music lot much more difficult. UH Music Chamber Groups: Wind Quintet, Saxophone Quartet, & Brass Quintet Free admission Music students: This concert is eligible for Mus 199 concert attendance credit. Piano-Instrumental Collaboration Concert Jonathan Korth, director An evening of sonatas and other concert works for solo winds or brass and piano, from classical to the contemporary. This concert is the culminating performance of students in the UHM Piano-Instrumental course. Tickets: $12 / $8 (UHM music majors free) No additional cost to purchase in advance. Music students: This concert is eligible for Mus 199 concert attendance credit. 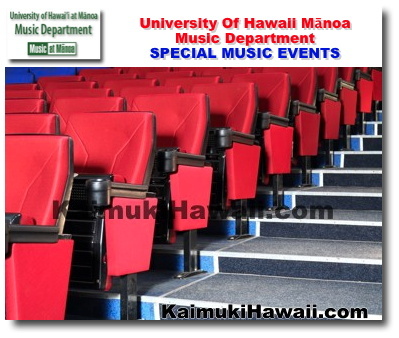 Visit manoa.hawaii.edu/music/events/ for a complete listing of Music Department events. The Music Department is located at 2411 Dole Street, Honolulu, HI 96822, (at the corner of University Ave.) on the campus of the University of Hawai'i - Mānoa. Our web address manoa.hawaii.edu/music. Providing statewide access to cultural and educational events featuring local and visiting scholars and artists.